The month of Moharram, the first in the Islamic calendar, marks the anniversary of the death of the Prophet Mohammad’s grandson, Hussein, who was killed at the Battle of Karbala in Iraq in 680 AD. His death is commemorated by all Muslims, but it is the sect of Shia Muslims who most openly participate in a mourning period for Hussein, whom they consider one of their Imams, or religious leaders. 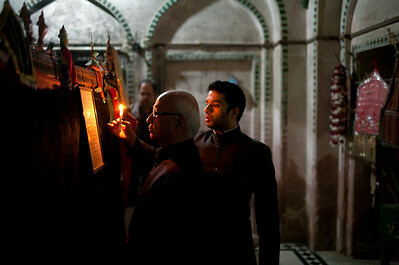 Expressions of grief amongst the Shia can vary quite widely, but the practices of the Shia in Lucknow, India are in many ways unique. There, the mourning period lasts entire months, much longer than the ten days that are observed by Shia Muslims in many parts of the Middle East. 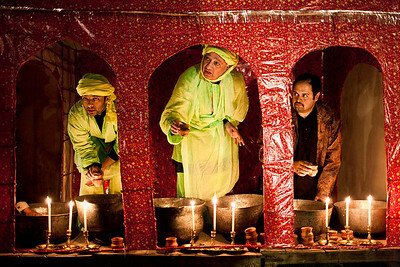 Their specific rituals also feature practices which are not found amongst the Arab Shia and are attended not only by the Shia, but also by Sunni Muslims, and even Hindus. 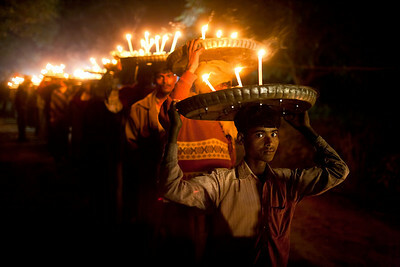 Taken in 2009, the following photographs chronicle the final ten days of the mourning period in the village of Mahmudabad located just outside of Lucknow in the Indian state of Uttar Pradesh. 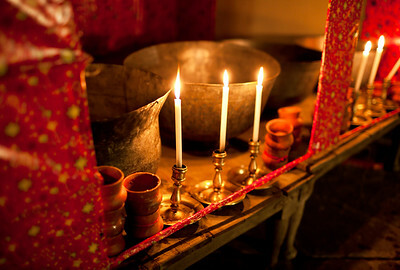 They feature the various rituals as practiced by the family of Mohammad Amir Khan, who is the Raja, or prince of Mahmudabad. These practices include majalis, or religious gatherings where a speaker reads a sermon to the audience and recounts events from the Battle of Karbala, various types of prayers, the setting up of drink stands called Sabeel, and also processions known in the Urdu language as juloos. The tenth and final day, Ashura, is the culmination of these practices wherein a giant paper and tin-foil replica of Imam Hussein’s Shrine in Karbala, Iraq is carried out to a field in the village to be buried, a practice which is repeated each year. Captions are provided with each photograph for background information on the specific practices. 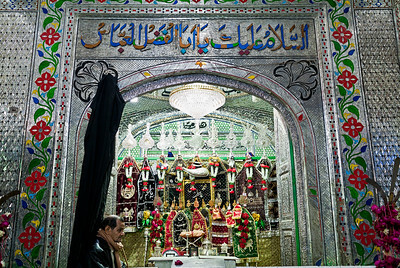 The Shrine of Hazrat Abul Fazl al-Abbas ibn Ali ibn Abi Talib in Lucknow which is visited by Shia Muslims during Moharram. 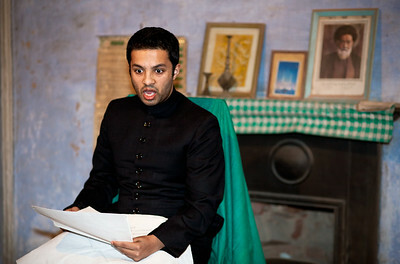 Ali Khan, son of the Raja of Mahmudabad, reading of a Marsiya at a majlis (religious gathering) in Lucknow. 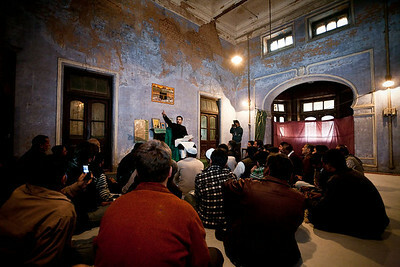 Majalis (the Arabic plural of "majlis") take place daily during Moharram, often multiple times per day. 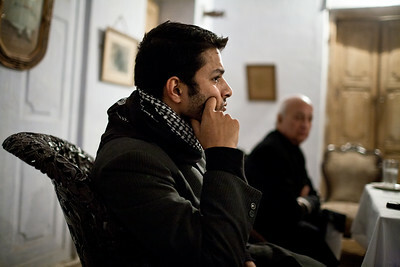 Ali Khan reading a Marsiya at a majlis in Lucknow. 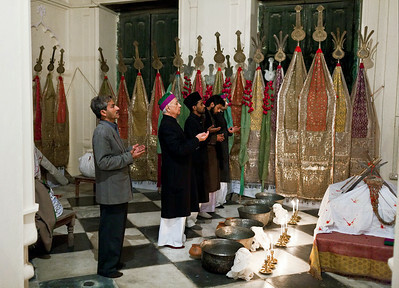 The Raja along with companions conducts the Nazar (dedication) at the Baradari in Mahmudabad. The Baradari is a large room in the Qil'a, or palace, of Mahmudabad which contains an area for delivering religious sermons as well as sections for specific rituals and observances. Tabarruk being distributed after a majlis in the Qil’a of Mahmudabad. 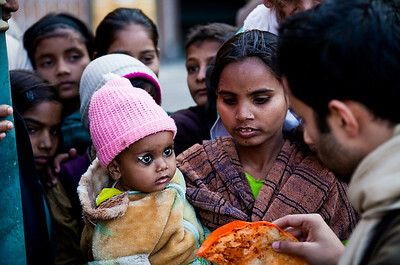 Here, villagers visit the home of the Raja to collect a donation of bread and cooked meats to take with them. 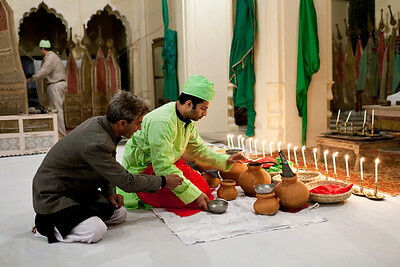 Preparing Sharbat as part of the Nazar in the Baradari in Mahmudabad. Sharbart is a type of drink which is offered to those attending Moharram rituals as part of the "Sabeel." Sabeel is a word in Urdu and Arabic which means "public fountain," in this case a stand which is set up for the distribution of the Sharbat drink. Prayers just before the distribution of the Sharbat from a Sabeel outside the Baradari in the Qil’a of Mahmoudabad. Distributing Sharbat from a Sabeel outside the Baradari in the Qil’a of Mahmoudabad. The Sabeel, or drink stand along with bowls and cups for the Sharbat drink. Reading of the ziyarat (a prayer recited when entering a shrine) at the Dargah, shrine of Abdul Fadl al-Abbas ibn Ali ibn Abi Talib. The shrine is located in Mahmudabad and is visited multple times by Shia Muslims of the village during Moharram. 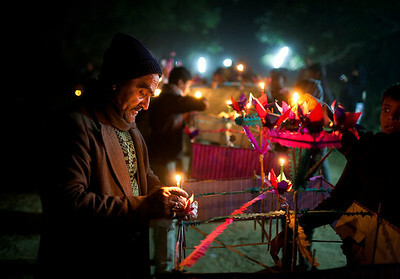 A man lights candles as part of preparations for the Mehndi ka Juloos, type of procession which commemorates the death of Qasim ibn Hasan ibn Ali ibn Abi Talib who was a Shia hero who died at the Battle of Karbala. This is one of the numerous Juloos, or processions during Moharram. 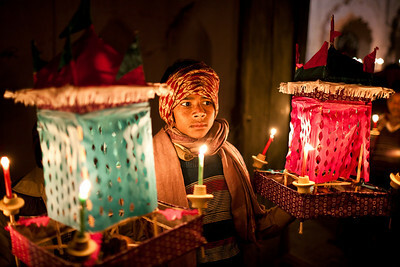 A boy in the Mehndi procession. Another section in the Mehndi procession. 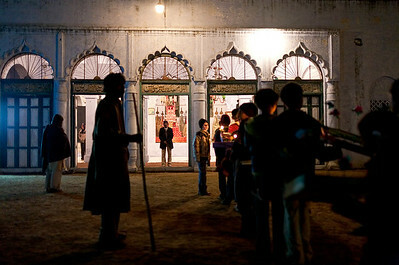 The Raja of Mahmudabad and his son Ali prepare for the arrival of the juloos coming from the Karbala Mosque, located on the other side of the village. 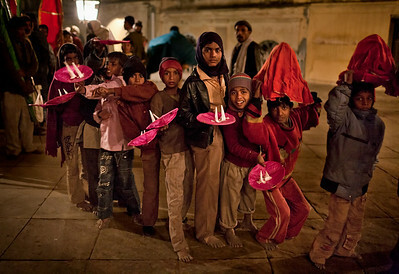 Young boys pose for the camera as part of the Mehndi procession arrives at the Baradari from the Karbala Mosque. 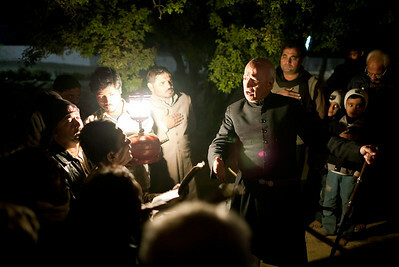 The Raja participating in the juloos. Here he strikes his chest in mourning and as an expression of solidarity with Imam Hussein who was killed at the Battle of Karbala. 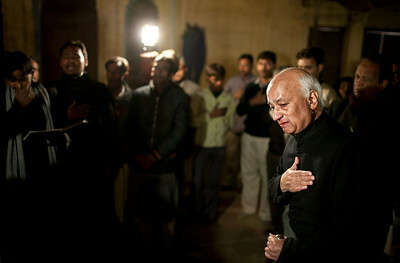 The Raja participating in the juloos. 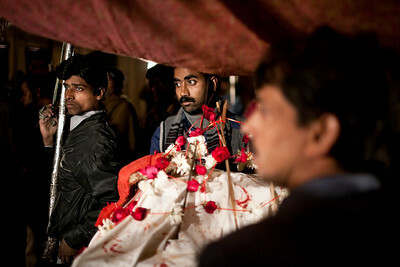 It is common to see participants in the processions and attendees of the majalis gatherings weep in a show of their grief, and all of the rituals are marked by a generally somber tone. The tabut, or replica of a coffin for Qasim ibn Hasan ibn Ali ibn Abi Talib, a Shia hero who died at Karbala. The tabut being carried as part of the procession to the zanana, or women's area of the house. Ali Khan, awaiting the start of a juloos in the Qil’a of of Bilehra. 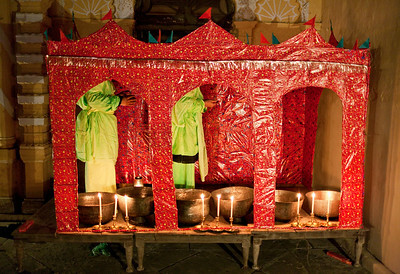 Bilehra is a small town near Mahmoudabad, and the family travels there to attend specific Moharram rituals. Ali has expressed his desire to preserve the customs and practices of his family which are in danger of being abandoned and forgotten. 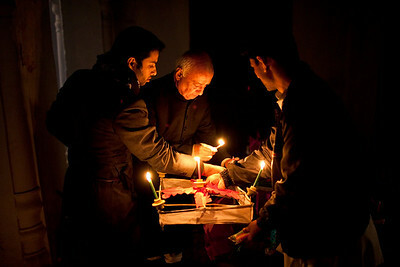 The Raja and his son light candles for the Mehndi juloos procession in the Mahalsara of the Qil’a of Bilehra. 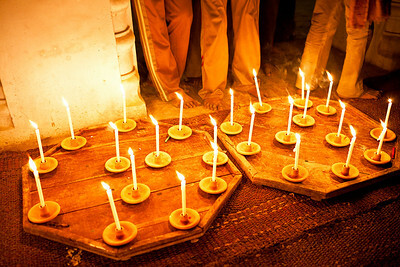 Trays of candles ready to be taken in the Mehndi procession in Bilehra. 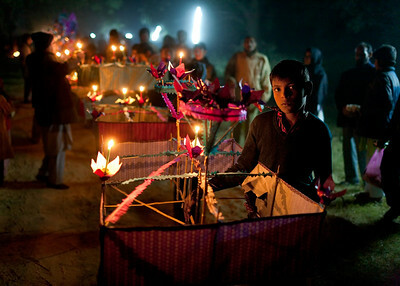 A young boy carries lanterns while awaiting the beginning of the Mehndi procession. Outside of the Baradari in the Qil’a of Bilehra as the Mehndi procession lines up to enter. 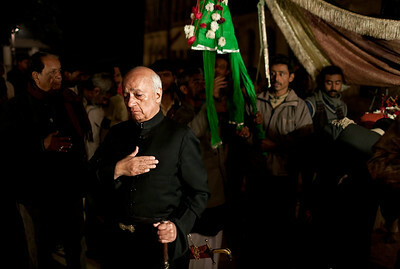 The Raja participating in the Mehndi procession en route to the Baradari in the Qil’a of Bilehra. Here we see one of the common features of the processions in which a small group leads the rest in the singing of emotionally-charged dirges. 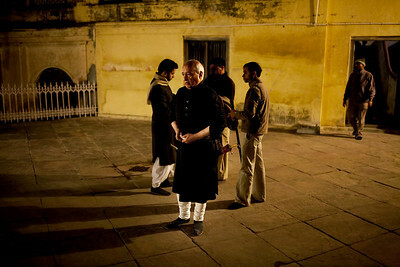 The Raja often participates and is proud to mention that his family was responsible for writing many of the eulogies.